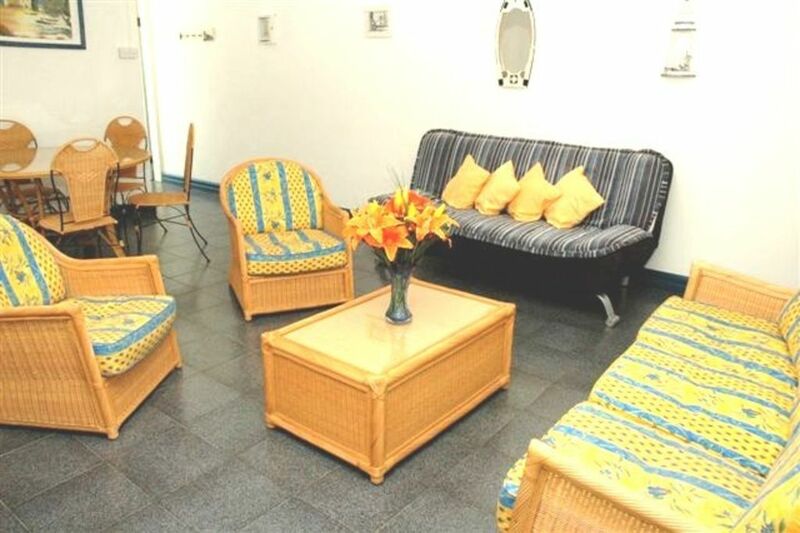 Ideally located within 2 to 5 minutes' walk to fabulous beaches, restaurants, shops, excursion agencies and all amenities, this 1 bedroom apartment is fully air-conditioned and tastefully furnished. There is a double-bed in the bedroom and a "Clic-Clac" sofa bed in the living/dining room. The apartment benefits from unlimited fibre optic wifi as well as all mod cons, including a digital safe, a flat screen television, an alarm system and a DVD/CD player. Bed linen and bathroom towels are provided, and your bed will be made prior to your arrival. Remote controlled air-conditioning In the bedroom and also in the spacious living/dining room. The open plan kitchen is well-equipped to prepare your own meals. The balcony leading from the living/dining area, features a wooden table table with 4 foldable wooden chairs. We also provide 2 foldable beach chairs, which you may use by the pool or at the beach. We have really enjoyed whole stay in this apartment. It was clean and very good located. There are everything nearby. Really nice beaches. Many restaurants and supermarket couple of steps from apartment. I can't forget to mention nice swimming pool which our baby enjoyed totally. Marcelina, lady who take care of daily cleaning was really nice person. She has been cooking for us very good meal for very good price. I would really recommend this to everybody. The owners ( who lives in London ) does everything to make your stay pleasant , giving you all the info you need to make your stay troublefree. We have stayed in this place for several months over the years, and are very pleased with everything. Halvar and Jorunn from Norway. We spent the month of november in this lovely spacious, comfortable and well equipped apartment. Staying for that length of time, we catered for ourselves quite a lot. The kitchen facilities were excellent, we even cooked a sunday lunch! Having Winners supermarket just 5 minutes away was a bonus too,enjoying the freshly baked baguettes most days. We used the local buses many times and the nearest stop are just at the end of the road. To add to that the beach is just 2 minutes further walking from the supermarket. The apartment is kitted out with a sun parasol and beach chair along with plenty of towels, so no need to incur the hire of expensive beach beds. We were also very happy to have the safety of an alarm system and a wall safe.The complex is kept very clean and despite being near the road, is very peaceful. Plenty of colourful birds buzzing about make for an enjoyable cup of coffee on the terrace. We availed ourselves of the many books to be found in the cupboard under the TV. But please bring your own taste in dvds. The pool is good for cooling down,but big enough for a bit of exercise if wanted! Marceline, your local host/contact is a gem and nothing is too much bother for her. The local restaurants are very near and a trip to Grand Bay is just 10 minutes on the bus. We would definitely recommend a visit to the Botanical Gardens(just take the Pamplemouse bus at the end of the road). The catamaran boat trips are a must, as is a day out at Ile aux Cerf. Also enjoy a day at the races(when the season allows) every saturday in Port Louis. We have thoroughly enjoyed our stay here and highly recommend it to all. After spending our hollidays elsewhere since 2011, we finally returned to our little private piece of paradise - Pereybere in Mauritius. It is the third time we are renting the appartmenet, so we instantly feel at home. We were greeted by both Marceline, who kept the place nice and clean for us and by Gerard and Sylvia, who - once again - made our holliday extra special with their never ending help and kindness. When we are at Pereybere, we love to go to the beach and relax, and that's how we spent most of the days. And for that purpose the appartement is perfect - enough room and facilitys and of course it's great with a private pool (some new sun-chairs would be great, though). This time we dined "at home" a lot more than ususal, thanx to the absolutely fantastic supermarket, that is placed just a few hundred meters from the appartement. This is really a great improvement. Our renuion with paradise was just as warm, sunny and relaxing, as we could hope for, and we hope to bed back allready next year - and of course we will be staying in "our" appartement in Pereybere. We booked for 5 weeks. We were met by Nanda at the airport which was a welcome sight after a long flight. As stated in previous reviews he is a mine of information and very helpful. At the flat we were welcomed by a smiling Marceline who showed us around and made sure we were settled in. The flat was everything as described in the listings, close to the beaches, supermarket and shops. It was pleasantly bigger than we had expected, clean and very comfortable. Sandra & Mark were very helpful prior to our arrival and gave us very useful advice on what to do and where to go. The only drawback was the tennis. The place were the courts were would not let us play on them which was a bit irritating as we had booked this apartment based on being able to play tennis. We however did find a court in grande baie which was a bus ride away. The beach cafe was not a very enjoyable experience as the staff were offhand the prices high, we didn't go there very often.The Thai restaurant was totally the opposite and was excellent. We had a meal cooked for us by Marceline which was very mauritian and tasty. We also booked a trip with Herve to flat island and he took us snorkeling and then cooked us a fabulous BBQ. A trip well worth doing. We would reccommend this flat and have already booked the larger flat for our holiday this year. We stayed two weeks in this very nice and comfortable appartement in Pereybere. It is very well furnished, and was close to a big store, where we could buy anything we needed. There are also various nice restaurants, with mauritian, indian, chinese, thai and european kitchen. The beaches and sea are amazing and are very close to the appartment (about 2 mins walk away), without any road to cross. Moreover Nanda and Marceline have been so nice and helpful with us during our whole stay. We made several excursions with Nanda. His taxi is comfortable and Nanda knows really a lot about the history of the island ! We also did a boat trip in a typical mauritian boat with Hervé. He took us on a beautiful quiet island with beautiful sand where we had a delightful barbecue. We really enjoyed our stay in Pereybere, and we already think come go back in the future.